Do 15 years old children believe in God? Are they happy? Are they in love? What is their favorite class? What’s the last thing they think before they go to sleep? 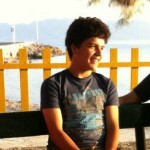 School-tube is the first television series that attempts to record the lives of teenagers across Greece by themselves. Each week School-tube takes us to a place of Greece and becomes the direct channel of communication between the generations. Without presenter, with humor, sarcasm, honesty and unexpected insight teens across Greece. The children lead or take the camera and show us the place where they live, their school, their room, their breakfast awakening, the break, the plates, their concerns, their hideouts and proving that teenage Greece adulthood loud. Boo Productions S.A. on behalf of ERT S.A.
SCHOOL-TUBE TEASER from Boo Productions on Vimeo.